One thing you might like to know about me and my beading habits is that knotting is my specialty. I learned to bead from Henrietta Verchick, author of Pearl and Beadstringing with Henrietta, so the first technique I ever learned was knotting between the beads. I still teach knotting lessons using Henrietta’s techniques, and one of the questions I am asked most often in these classes is, how do you know when to knot, and why do you knot? The only real hard and fast rule is that you ALWAYS knot good pearls. The reason is two-fold: The first is, if the strand breaks, you won’t lose your pearls. Secondly, the substance that makes pearls so beautiful is the nacre, the beautiful coating on the pearls. If your pearls rub together (or against another bead,) the nacre will wear off and your pearls will lose their value and their luster. The organic nature of pearls is also why we use silk to knot pearls – you want the natural pearl against the natural silk, not a synthetic. That being said, I don’t always knot the more inexpensive freshwater pearls. Another reason to knot is that knotting gives a soft, drapey look to your necklace that you will not get with straight stringing. I also like to knot because silk comes in an amazing array of colors that can enhance the look of your necklace. Because the knots show, you have the opportunity to use the beautiful colors of the silk thread to add to your design. For instance, you can use a soft green with Fancy Jasper, and it will just fade into the background, which is fine. But if you choose a lilac or tanzanite-colored silk you will see the lovely lavender colors of the stone “pop.” You can even use two colors of silk for extra zing – I once used an olive-green thread and a peach thread when I was knotting Unakite beads. Fantastic! Gudebrod silk is one of my favorite stringing media – it comes in sizes as fine as Nymo, or thick enough to use with a large-holed gemstone bead. It is the ONLY thing to use for knotting! Silk is strong and supple, and comes in lovely colors from Plum to Chestnut. You can use the larger sizes (F to FFF) to crochet with beads, or for micro-macrame. 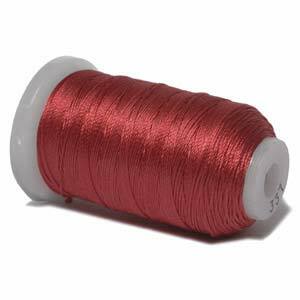 And you can make a self-needle out of silk thread (I will cover that in a later post.) And did you know that fishermen use silk thread to tie decorative flies? Here is a handy chart to know how many yards are on a spool of Gudebrod silk beading thread.